This book has three distinctive characteristics: (1) It offers a widely interdisciplinary perspective; (2) It provides a comprehensive view of poetry, with groups of chapters on the Sound Stratum of Poetry (rhyme patterns and gestalt theory; metre and rhythm; expressiveness and musicality of speech sounds); the Units-of-Meaning Stratum (semantic representation and information processing, metaphor, rhyme and meaning, literary synaesthesia); the World Stratum; Regulative Concepts (genre, period style, archetypal patterns); the Poetry of Orientation and Disorientation (experiential and mystic poetry versus poetry of emotional disorientation; and the grotesque); the Poetry of Altered States of Consciousness (hypnotic and ecstatic poetry); Critics and Criticism; and Cognitive Poetics vs. Cognitive Linguistics; (3) It goes into minute details of poetic texts, so as to account for subtle intuitions of readers. Updating from the first edition consists of samples from the authors later instrumental study of the rhythmical performance of poetry and the expressiveness of speech sounds; and in three chapters responding to the later work of three cognitive linguists. In one of the founding studies of cognitive literary criticism, Tsur combines earlier theoretical approaches (such as Russian formalism) with methods from cognitive psychology and other fields within cognitive science, resulting in a capacious and suggestive survey of many aspects of literary form in light of their perceived effects on readers. "Literary Theory and Criticism: An Oxford Guide""
Tsur's cognitive poetics is of a more general kind than the one developed in relation to cognitive linguistics, as may be gleaned from his seminal overview "Toward a Theory of Cognitive Poetics" (Tsur 1992). 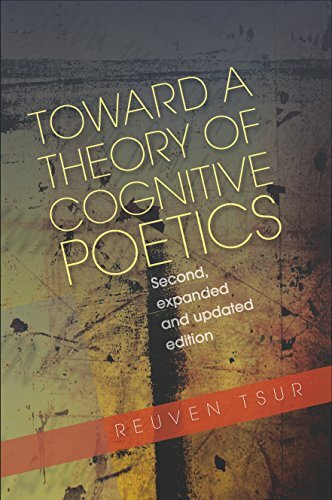 From the Introduction, in Joanna Gavins and Gerard Steen, "Cognitive Poetics in Practice""
Tsur synthesizes his thinking over 25 years that led to the notion of cognitive poetics. He discusses such aspects as the sound stratum of poetry, regulative concepts, and poetry of altered states of consciousness. This edition includes responses to critics of the first edition. "Reference & Research Book News""